Howdy! 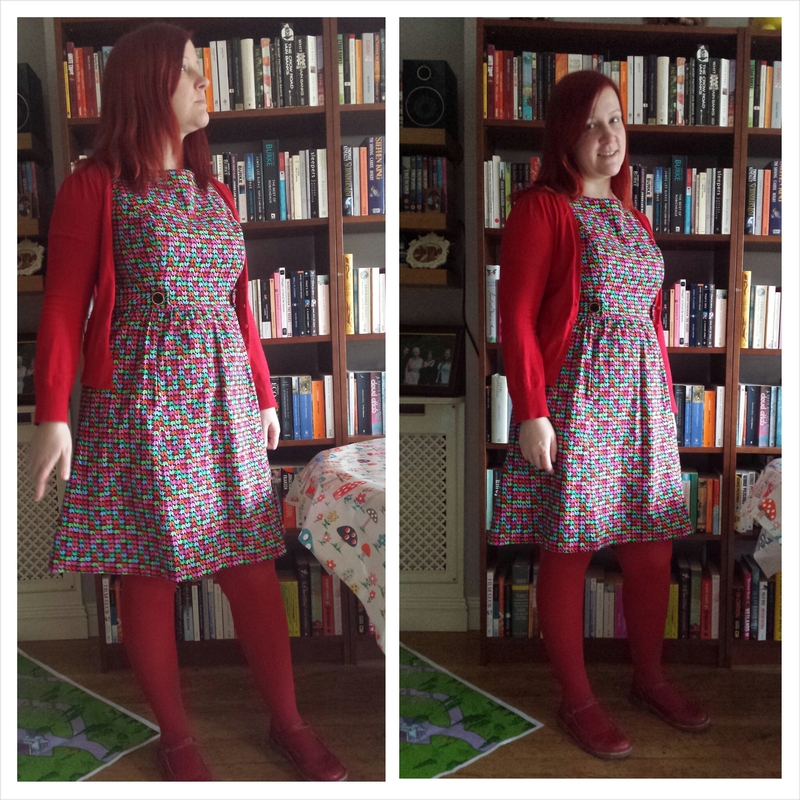 Today I want to show you a dress I made a few weeks ago now – Simplicity 1652 which is part of their ‘Amazing Fit’ range. I made it with a fabric called ‘Up and Down Elephants’ by Timeless Treasures – the fabric was a Christmas gift! Yay! 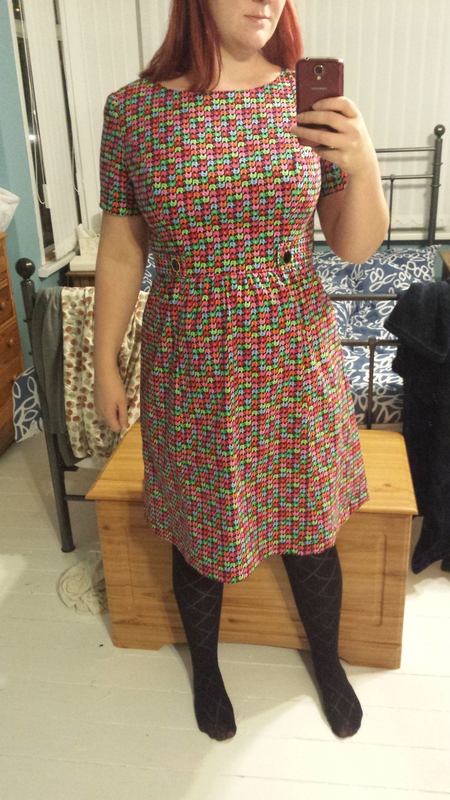 I bought this pattern last summer, but it was seeing Kat’s lovely version that reminded me to dig it out and make it, plus I wanted to try a new pattern before I bored you all to tears with yet another variation on the Anna dress!!! I made view A of the pattern, with the front tabs and proper sleeves, but chose view B for the back because I am partial to a cut out back. It just adds a bit of unexpected interest. Ironically though, with it being winter and all, I’ve had to put up with feeling a bit of cold air on my back because of the cut out. I have worn a cardigan with the dress a few times to avoid the chill, but then I get annoyed with myself because by wearing a cardigan I’m covering up the very feature of the dress I like best of all! In short – this dress will definitely be better for me to wear when it has warmed up a little! 1) The fabric!! I love the elephants. I love the colours, and the fact that from a distance it almost looks like multi-coloured houndstooth! 2) The fit!! It really is an ‘Amazing Fit’. I chose the D cup option and it was great not to have to worry about doing an FBA. It fits beautifully. 3) The pattern instructions!! Because my body measurements aren’t wildly out of sync with those on the pattern envelope, I did not have to make a toile. Instead, I just fitted as I went along, using the helpful tips provided in the pattern instructions. 4) The design/pattern drafting!! I love the different options you can get with this pattern: sleeves, cap sleeves, sleeveless, cut out back, normal back, front tabs, no tabs… And all options have pockets. And pockets are a WINNER. 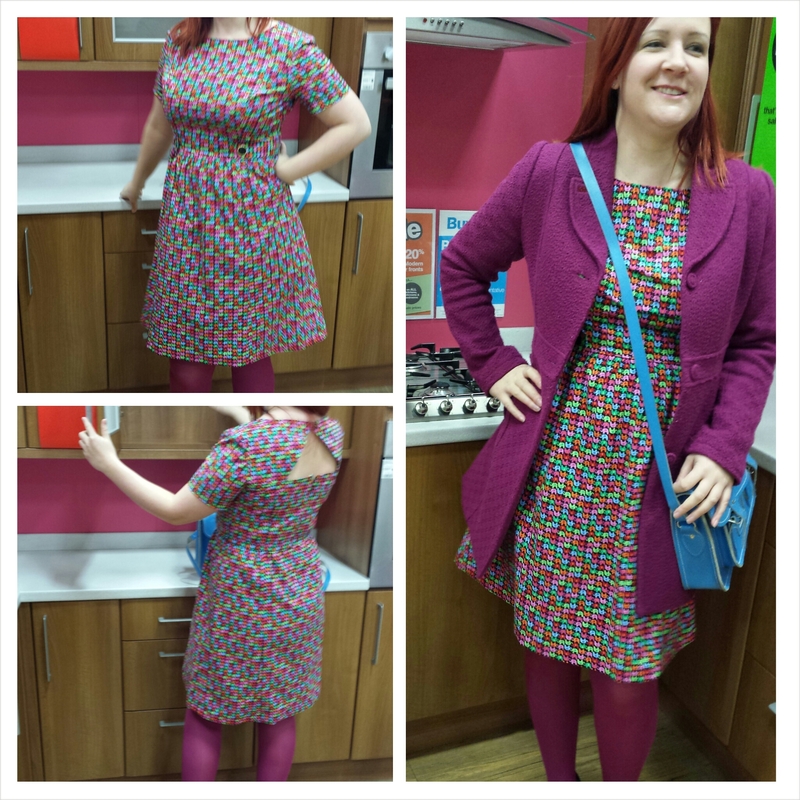 With pink coat, pink tights, and black shoes…and yep, I’m in B&Q showroom! Lucky for me, I have a pretty extensive range of red and pink shoes, so that’ll keep me going for a while whilst I work out my ultimate favourite way to wear this dress!! The fit is perfect on your dress and I love it with your pink accessories. Love it! The nellies are very cute. Pink gets my vote! Oooh, it’s gorgeous! it looks great in every combo, but I definitely think you rock it with the pink coat and tights! Thanks Marie. It’s good to have plenty of options, anyway! That is really lovely! I have been wondering whether they really are an “amazing fit”, but after seeing this I think I’ll have to try one of their patterns out! I think it’s a good investment! It looks so amazing with your pink coat! Great job! Good to know that the fit really is good on these. Did you chose your size based on the finished measurements or are their suggested measurements ok with these? I usually have to go down about 2 sizes with Simplicity! I use the finished garment measurements as my guide, and if still in doubt I go smaller rather than larger! Wow, that sounds like a bargain! This is a really lovely dress! Such cute fabric too. I have 2 different Amazing Fit patterns but have not sewn them yet. I really like having the different cup sizes to chose from. Thanks! I’ll definitely be trying the Amazing Fit patterns again in future! That fits you beautifully! And I love the colourful outfits! Thanks Gillian. 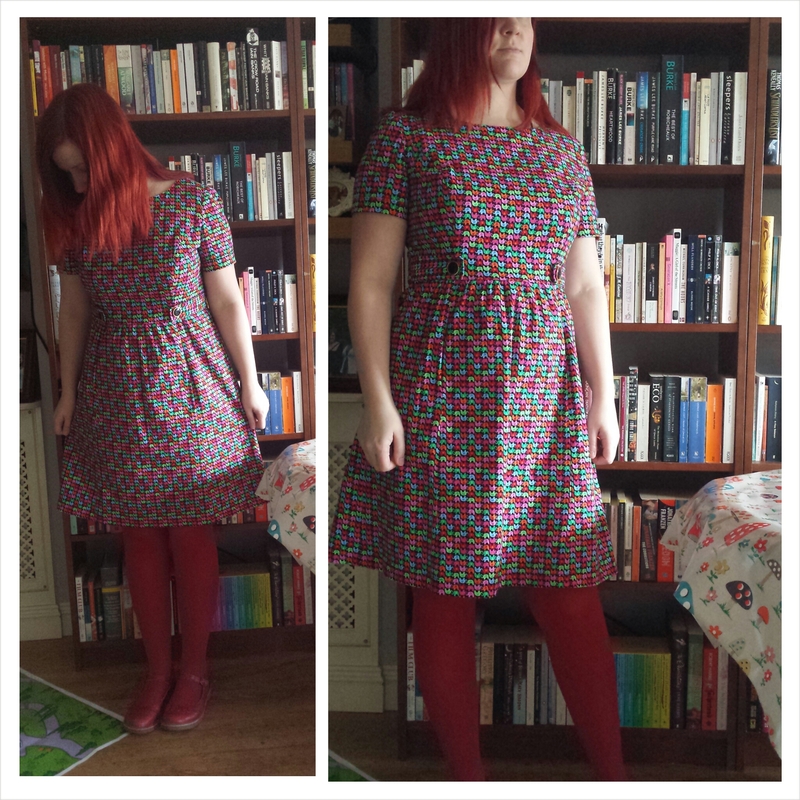 It is a very flattering fit, I’m pleased with it! Your dress has to be the nicest I have seen in a very long time…it fits your body perfectly and your sewing and pressing is perfect too! I’m sure you will receive so many compliments when you go out no matter whether you wear it alone or with jackets…Well Done, Tabatha! They weren’t kidding when they say amazing fit! That fabric is beautiful. You will get a lot of wear out of that dress. Thanks. I already have worn it a lot! 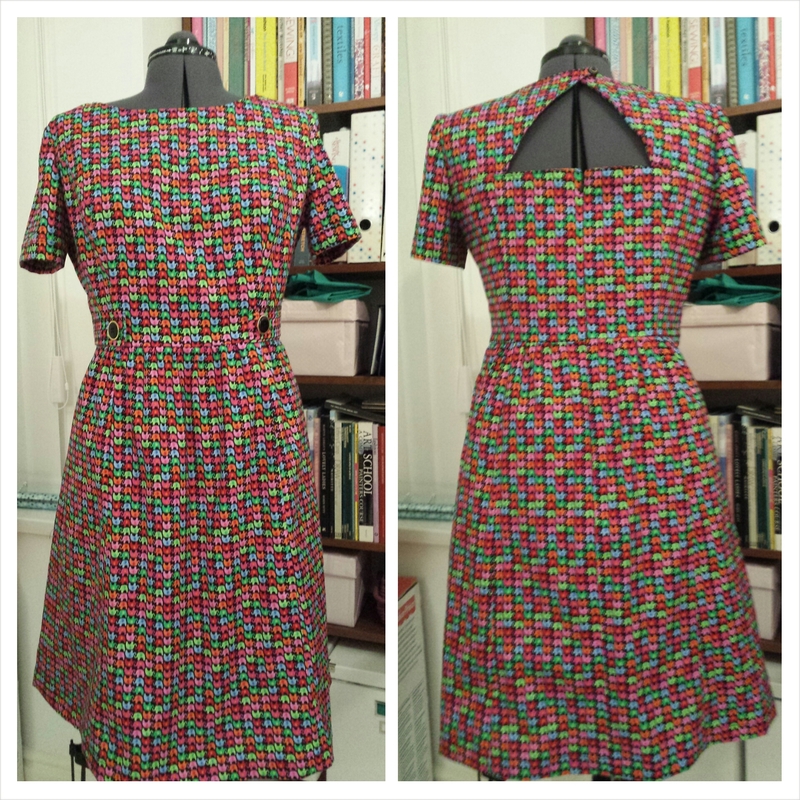 Glad to have inspired this gorgeous dress, love the fabric, love the cut out back detail – love it all! And it really is a great fit. Ooh, love this! Especially the cut out detail in the back! I find cut out backs hard to resist! It’s the perfect dress that goes with everything! You’ll never get bored mixing it up with those accessories. Thanks Claire! Yep, there are plenty of options to keep me going. I have an orange cardigan I can try with it too! Love it and so refreshing to hear the fitting was relatively painless. I was going to buy this on a 50% of sale and was put off by all the comments regarding problems with fit, especially gaping around the back cut out. Maybe there is hope for me yet?? Love that you can style it with so many colour combos! Lovely work. It does gape when you’re in certain positions, actually, but it doesn’t bother me and it would probably be easy to fix by taking a bit out of the CB seam, maybe? It’s all been said! I like all the looks but as lime green is my very fav. colour, I’d love to see that combo! Wow! Well I have no lime green cardigans, tights, shoes or coats! Ooh, I love this! The fit is perfect, I really need to try one of these patterns. And you can’t go wrong with elephants. Thank youuuuu! There was a point where I was like “I’m 33: should I really be making myself an elephant dress?”. But that was a moment of folly. Elephants for the win! Thanks! Pink is my favourite. What a fab dress, the fit is indeed amazing! And I love the elephants. Re the cut out back, I have the same problem with my Belladone dress.